Donald Trump's Advisers Blast Justin Trudeau After G7 Summit: "There's A Special Place In Hell"
President Donald Trump left America's closest allies dismayed Sunday after he yanked the U.S. endorsement of a Group of Seven economic agreement and then unleashed a Twitter attack - echoed by further harsh criticisms from his White House advisers - on Canadian Prime Minister Justin Trudeau. Trump's actions deepened the divide between the United States and its allies, and European leaders Sunday expressed shock and resignation at this latest sign that the president is eager to defy diplomatic norms and blow up trade relationships that have been strong for decades. Trudeau announced the agreement at a news conference, and then, taking questions from reporters, reiterated his objections to Trump's imposition of tariffs on steel and aluminum from Canada, Mexico and the European Union. Trump took umbrage at those comments. Traveling on Air Force One to Singapore for the historic summit with North Korean leader Kim Jong Un, Trump charged Trudeau with "false statements" and accused him of being "dishonest" and "weak." "POTUS is not gonna let a Canadian prime minister push him around," Trump's chief economic adviser, Larry Kudlow, said on CNN's "State of the Union." "He is not going to permit any show of weakness on the trip to negotiate with North Korea." "So this was about North Korea?" CNN host Jake Tapper asked. "Of course it was, in large part," Kudlow said. "Kim must not see American weakness." Peter Navarro, Trump's top trade adviser, denounced Trudeau with language rarely used even against America's adversaries. "There's a special place in hell for any foreign leader that engages in bad-faith diplomacy with President Donald J. Trump and then tries to stab him in the back on the way out the door," Navarro said in an interview on "Fox News Sunday." "And that's what bad-faith Justin Trudeau did with that stunt press conference." There is no obvious precedent for such a coordinated and acerbic series of attacks by White House advisers on a stalwart U.S. ally. Some foreign policy experts argued that North Korea's Kim could see the chaos at the end of the G-7 gathering as an opening to gain leverage on Trump in negotiations, with Trump looking to avoid having two summits collapse back to back. Trump had initially roiled the waters by saying Russia - expelled from what had been the G-8 after its annexation of Ukraine's Crimean Peninsula - should have been allowed to participate. Trump later said that while he has strong personal relationships with Trudeau and other leaders, he believes their countries are ripping off the United States through high tariffs. He threatened to stop all trade with any country that did not lower or even eliminate tariffs. The leaders eventually agreed on the joint communique, which included pledges to engage in "free, fair, and mutually beneficial trade and investment." The statement also spoke about protecting the environment and "removing the barriers that keep our citizens, including women and marginalized individuals, from participating fully in the global economy." Trump then departed. Trudeau appeared at a news conference and initially struck a celebratory tone, saying, "I'm happy to announce we've released a joint communique by all seven countries." The prime minister had played down divisions between the United States and the six other members of the G-7. As the summit host, Trudeau would not have wanted the four-decade-old G-7 to collapse in his country. 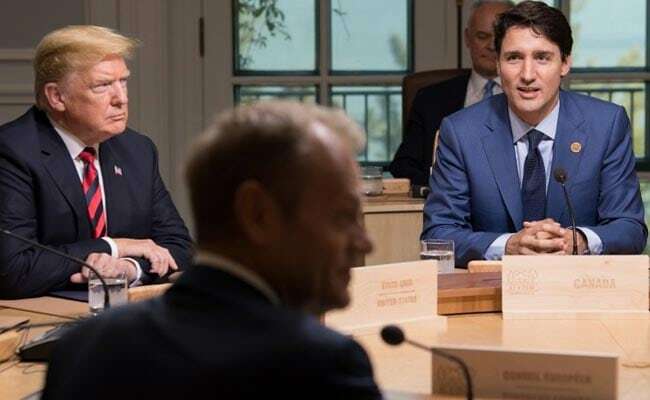 But when questioned about the U.S. imposition of tariffs on steel and aluminum, Trudeau reaffirmed his intention to retaliate on July 1 with equivalent tariffs. He said the Trump administration's use of a national security provision to impose the tariffs was "kind of insulting," given that Canadians have fought side by side with Americans in foreign lands. He said of his decision to impose new tariffs, "I have made it very clear to the president that it is not something we relish doing. But it is something that we absolutely will do. Because Canadians, we're polite, we're reasonable, but we also will not be pushed around." Those were fighting words for Trump. On Twitter he accused Trudeau of "false statements" and wrote that he had ordered his aides to withdraw U.S. endorsement of the joint communique. He didn't specify what he considered false about Trudeau's statements. "PM Justin Trudeau of Canada acted so meek and mild during our @G7 meetings only to give a news conference after I left saying that, 'US Tariffs were kind of insulting' and he 'will not be pushed around.' Very dishonest & weak. Our Tariffs are in response to his of 270% on dairy!" Trump wrote. Trudeau did not seem eager to match Trump's rancor. When the Canadian prime minister went on Twitter Sunday morning, he did not explicitly address Trump's comments, choosing instead to highlight the virtues of the G-7 agreement. "The historic and important agreement we all reached at #G7Charlevoix will help make our economies stronger & people more prosperous, protect our democracies, safeguard our environment and protect women & girls' rights around the world," he wrote. "That's what matters." Paris wrote on Twitter: "Big tough guy once he's back on his airplane. Can't do it in person, and knows it, which makes him feel [weak]. So he projects these feelings onto Trudeau and then lashes out at him. You don't need to be Freud. He's a pathetic little man-child." A number of G-7 officials had tried to brush aside Trump's comments during the Quebec summit, suggesting he was trying to show bravado ahead of his talks with the North Korean leader. But things escalated dramatically Sunday with the full-scale White House attack on Trudeau. Kudlow, appearing on both CNN and CBS, repeatedly charged Trudeau with the "betrayal" of Trump and other G-7 leaders. "He really kind of stabbed us in the back," Kudlow said on CNN. "It's a betrayal. It's essentially double-crossing. Not just double-crossing President Trump, but other members of the G-7." When he went on CBS' "Face the Nation," Kudlow made explicit the connection between Trump's rhetorical jabs at Trudeau and the need to appear strong in Singapore. "Trudeau decided to attack the president. That's the key point. And yes, you know if you attack this president he's going to fight back," he told host Margaret Brennan. "But here's the key point, Margaret, [the] president is going to negotiate with Kim of North Korea and Singapore. It is a historic negotiation and there is no way this president is not going to stand strong. Number one, he's not going to allow the people to suddenly take potshots at him hours before that summit, and number two, Trudeau should've known better."